LX-100 Series data acquisition and recording system was designed for reliable use in the lab and the field, and quick data processing. Following the convenience of TEAC DAT technology, the LX-100 Series enables a wider recording bandwidth. The connectivity to a transducer and PC are enhanced to meet the customer needs and offer cost-efficient data acquisition. The LX-110 provides superior recording and playback performance with selectable recording media and input/output configurations. In addition to all recording and playback features of the LX-110, LX-120 provides the selection of additional sampling rate and Tachometer pulse inputs. A DC input amp card with lower sampling (from 1kHz to 1/60Hz), a selectable DC/IEPE(*) accelerometer input amp card, and a selectable DC/IEPE(*) accelerometer input amp card. The output amplifier card outputs the analog voltage during recording and plays-back the analog voltage. 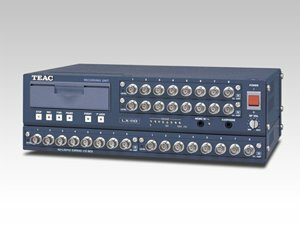 8 or 16 recording channels with a main unit or 32 channels using an expansion unit. Memory - From standard 64MB to 576MB of internal memory achieving the maximum recording rate. PC card - Supports up to 8GB* PCMCIA Type II or Compact Flash enabling the recording in harsh environments. Through a remote control unit (stand -alone) or PC (LX Navi software), the LX-100 Series can be fully controlled. The recording format is TAFFmat which is compatible with Windows file system and it is commonly used by TEAC Digital Data Recorders. The TAFFmat data file can be read by LX View software and by many other popular analytical software applications. 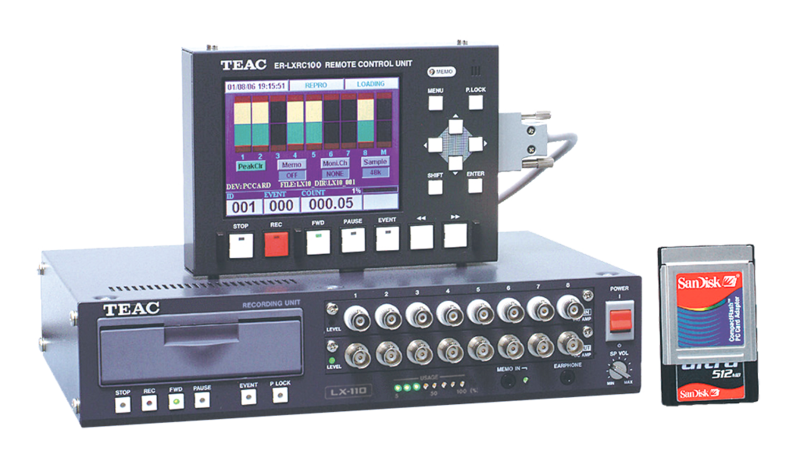 A real-time front-end software (Windows DLL) is also available for a system integrator for direct control of LX Series recorders. Contact us for details. (Excluding protruding parts) Approx 11 13/16" x 2 9/16" x 7 7/8"